5S Methodology | What is 5S Methodology? 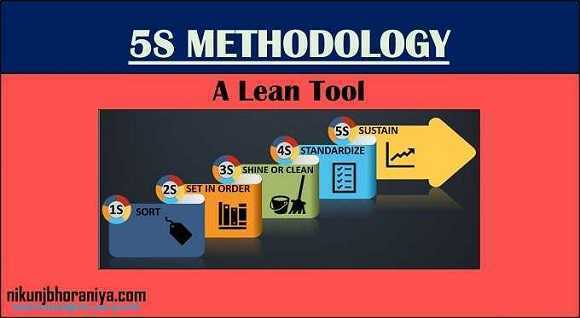 HomeLean Tool5S Methodology | What is 5S Methodology? ➝ 5S Methodology was developed in Japan. 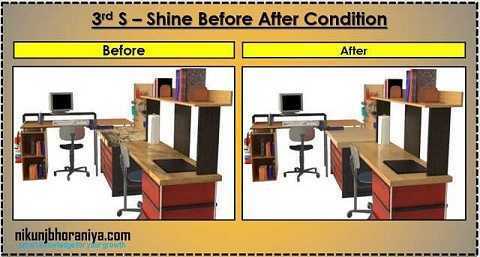 ➝ The 5S Methodology is a system for organizing spaces so work can be performed efficiently & effectively with safely. ➝ It is a fundamental tool of Lean Manufacturing. → 5S Methodology is a system for organizing spaces so work can be performed efficiently & effectively with safely. ➝ It is also a well known Lean Tool. → 5S Methodology was developed in Japan by two gentlemen, Osada, and Hirano who structured a framework for implementing their philosophy. 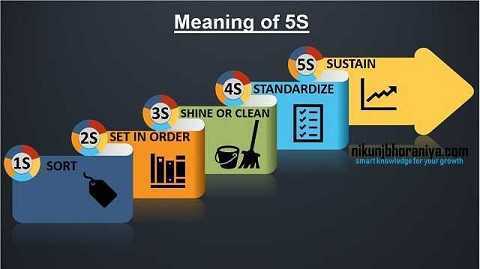 → Some say that principles of 5S Methodology came from Henry Ford, who was using CANDO (Cleaning up, Arranging, Neatness, Discipline, and Ongoing Improvement) prior to the development of this Methodology. → The first step is Sort in this Methodology. 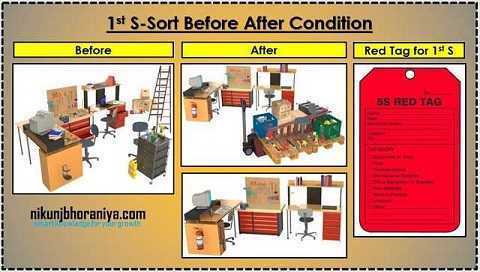 → "Sorting" means to sort everything in each work area that what we need and what we do not need? → Sort means removing unnecessary items or materials from a workspace. → Keep only what is actually required every day from the workspace. → Materials, equipment, instruments or any items that are not frequently used should be moved to a separate, common storage area called Red Tag Zone. → Items that are not used should be removed or recycled. → Please do not keep anything in your workplace just because it might be used in the future. → All unidentified items should be put in the “Red tag”/ quarantine area. → Only items that are required should remain. 5. Recycling or Reassignment of things arrived in Red Tag Zone. 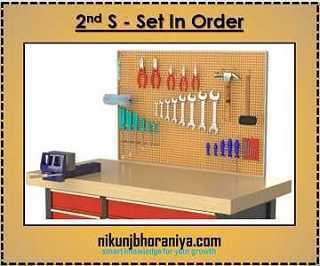 → Set in order is for organizing the items or materials at the workplace. → To arrange all necessary items for the economy of movement. → Place according to the frequency of use. → Provide safe storage – heavy items at a low level, light items at height. → The things that are used very frequently should be kept nearer to where they are used. → Items that are used very few times should be kept far compare to frequently used things. → After completion of work keep things in its defined place. → If several things are used together, then store them together. → For example, a welding rod is used with welding machine then both should be kept together. → Store things in place where people can easily find it. → Identify all items (including fixtures, gauges, tools, jigs, molds, etc.) and label them so that anyone can identify and return them to their proper storage location. → After Sort and Set In Order, the workplace requires regular cleaning. → Cleanliness makes defects easier to detect. → Every workplace should have a person, or group, assigned to clean that area. → The best approach is that who work in a workplace is also responsible for cleaning that area. → After completion of Sort, Set In Order and Shine or Clean, Standardize will come. → Standardize means documenting all necessary processes or activity. → In Standardize we can turn Good Practices into Good Habits. → By developing standards for process, all person knows what to do, how to do, when to do and where to do, etc..
→ Give awareness about standardizing to all person. → It will help them to remember the new standards and it encourages them to do the same. → We can use labels, symbols, posters, and banners for standardization. ➥ (A) How do we Standardise? → Common methods to show where the work enters and leaves the cell. → Sustain needs to maintain 5S within the factory or work pace. → Keep a record of progress with evaluations, communication, and training related activity. → Sustain keeps watch on on-going training activity and maintaining the established System. → Making it “A way of Life”. → We can sustain commitment towards 5S in our industry with the help of Top management's support. 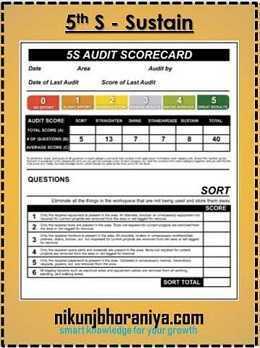 → Conducting 5S inspections on a random basis. → Establish a proper communication channel from top to bottom and bottom to top. → Provides training to employees. → Participation in promotional events at the factory. Keep posting Quality documentation details. Nice star Nikunj keep it up. Very Nice Nikunj. IT is helpful to all and easily understood to any one. Very good Nikunj , It is really useful for all of us as well as any manufacturing industries to devlope a basic fundamental. It's a really helpful us. And we growing our knowledge about Quality Core tools to only because of this Blog . Thank you sir for this useful and valuable information. keep it up Nikunj. Your presentation is very impressive. Good job Sir. Keep going. Please provide more information about Production and Manufacturing. The contents that you are giving is really helpful. I am having one request that, can you make a brief introduction about the six sigma various belts i.e., White, Yellow, Green & Black also....?